Build Your Own Harper Hand Truck for less! 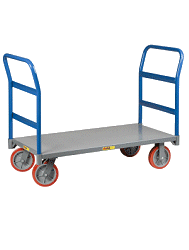 Harper Hand Truck for less! Harper was the first in the market with the new strong light weight composite frames. Frames are chemical and corrosion resistant. The "N" series is designed to handle flat or cylindric objects. This new series is available with six different handle styles and three sizes of extruded aluminum toe plates. Nose extensions, and stair crawlers are also available. Eases loads over stairs and curbs. Accesorries will also be added if selected.